Life for young people in Jamaica can be tough. With high unemployment rates and low wages, it is often difficult to think positively about the future. This is something the Queen’s Young Leaders Programme is determined to help change and thanks to grants it makes to projects in Jamaica, more young people are being given the opportunity to learn new skills, find jobs and become leaders in their communities. With more than a quarter (25.4%) of young people aged 15-24 in Jamaica currently unemployed, it is more important than ever to ensure that they are supported and empowered to achieve their potential. On World Food Day – which promotes the importance of food production around the world – we celebrate two Queen’s Young Leaders-supported projects which are working to change the way young people think about farming and enable them to create their own successful businesses. At the Village Academy young people from disadvantaged backgrounds, who have no experience in farming, are receiving life-changing training and support to create their own farms or small-holdings. Their training involves a wide variety of agricultural activities, from how to keep bees and chickens to planting and cultivating crops. The centre is a public-private partnership between Sandals Foundation, the government and other organisations. As well as receiving agricultural training, with a focus on new technology, the young people can also get a basic high school certificate. After their training, participants have the opportunity to set up their own business with a start-up of livestock or capital and mentoring. The project is part of a national initiative to improve links between the agriculture and tourism sectors in Jamaica; raising the awareness and promotion of agriculture as a viable career choice to young people. This World Food Day farmers, businesses, governments and individuals are being encouraged to think about the part they can play to ensure that there is #ZeroHunger in the world by 2030. In order to achieve this important aim, one of the recommendations from the Food and Agriculture Organisation of the United Nations, is that farmers should find new, more productive ways to farm food and diversify their crops. This is something which is being promoted at the Jamaican Youth Business Trust (JYBT), which is also supported by a Queen’s Young Leaders Grant. The project helps young people build a brighter future for themselves by providing opportunities for them to learn new skills and find employment within the agricultural sector. Through training programmes like its Youth in Agriculture programme, it provides financial support and practical tuition, such as teaching young people how to plant and tend different crops, to help aspiring farmers achieve their dream of creating their own start-ups. JYBT programme manager Tanesha Patterson explains: “Now farmers can use their phones to check the weather and the prices of their crops, as well as to keep in touch with their customers and suppliers. These are the things we need to promote to young farmers. We encourage them to think of themselves as serious business leaders in terms of their ideas and thinking and how they approach business. 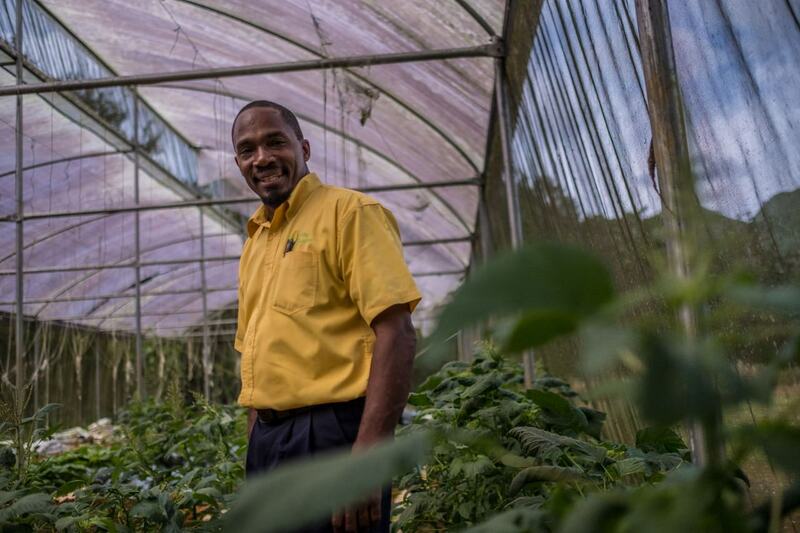 Currently just 18% of people of working age are employed in the agricultural sector in Jamaica. This figure is down from 27% in 1991. But both the Village Academy and JYBT are working hard to change this and they have already achieved some fantastic results. Read more about their success stories with Kellicia and Semone.